Wow, Turns Out I Am “Pro-Choice”! Today I am outraged. The kind of rage that builds up slowly over time, until one day you literally feel like your head will explode if you don’t get all your thoughts out of it. Today I came across this story: Another of the thousands of stories of good women, trying to do what is best for their family, and being treated like criminals. This particular woman wanted to try to have a vaginal birth after having previous cesareans. She was not hell-bent on a vaginal birth, just wanted the opportunity to have the chance to try. Well, the land of the free took that choice away from her, and also threatened to take away all of her children should she attempt a vaginal birth. This woman was unfairly pushed into a corner, forced to give birth in a way she did not choose, and threatened. And I can’t tolerate it. In a country where we are free to choose if our unborn children live or die, why are we not given any governing over how we bring them into the world?! And why are the safest methods of delivery the ones under attack? (Well, I have a few guesses, but that’s a whole other blog post. But my guesses certainly don’t involve anyone having the woman or child’s best interest at heart.) What does it say about a country when we are fighting more for the right to abort than we are for the right to give birth? What does that say about how little we value life, children, and women? It says a lot. And none of it’s good. In the USA we sure are pro-choice. You can choose to not only kill your baby before it’s born, but there’s a plethora of other heinous choices you can make, all of which you won’t be judged for, because hey, it’s your choice! You are free to treat your spouse horribly. You can cheat on them, judge them, control them, put them down, and ruin their life in all sorts of safely chosen ways. You can choose to let your kids eat junk food, watch inappropriate movies all day, or play violent video games, and not have to worry about anyone threatening to take them away. You really can choose to just be a down-right, rotten person, or parent. Here in the land of pro-choice, it is just as acceptable to choose being a crappy person as it is to choose to be a good one. Well, guess what I choose…. Chances are, none of these things are as protected as a woman’s right to choose none of them. And to me, that’s a pile of garbage. A failure of an entire country. And certainly, a huge disappointment and heartache to God. Well, if women in this country can choose to abort their babies, other women can choose to give birth to as many children as they want. Even if that means they go on welfare, or do something really controversial like breastfeed. If we protect one end of the spectrum, we have to protect the other. It is also clearly documented that the US has a horrifically high cesarean rate with some of the WORST birth outcomes in the industrialized world. Research also shows that VBACS are SAFER than repeat cesareans, yet women have to sign a waiver at a hospital to have a VBAC, and there is no waiver explaining that a repeat cesarean is much more dangerous than a VBAC. I guess hospitals are also pro-choice, as in they get to choose if they share valuable information with you or not. And since when is a vaginal birth a choice? I’m pretty sure that’s how it was designed to work… It really boggles my mind that woman have to fight for the right to choose to use their private parts for their intended purposes. So along those lines, if women can choose to flaunt their breasts and sport cleavage anywhere and everywhere, then women can also choose to breastfeed anywhere and everywhere. A culture that claims to be too conservative to handle breastfeeding should also be disgusted by the over-sexualization of women’s breasts that we are constantly bombarded with. And if some women can choose to sexualize their breasts, then other women can choose to normalize their’s, and nourish and comfort with their breasts, without fear of judgement and cruelty. Same argument for parents who choose to feed their children nothing but junk food. I’ve never heard of a woman being kicked out of a park for feeding her kids cheetos, but I’ve sure heard of it for breastfeeding. RIDICULOUS! There are two sides to every coin, and we have completely forgotten the other side of “pro-choice”. 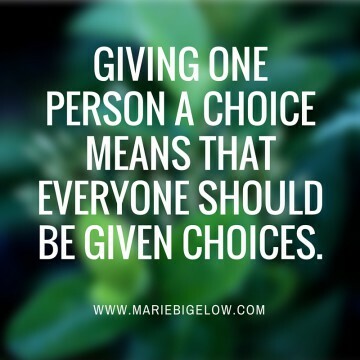 Giving one person a choice means that everyone should be given choices. As women, mothers, and daughters of God, we ALL have the right to CHOOSE. And if one women is fighting for the right to a healthy and normal birth, we all should be fighting; or someday, our daughters may have NO choice when it comes to giving birth. Choice with birth also implies that women are capable of making the best choice for themselves, and their babies. And women definitely are capable of this. The medicalization of birth has made women feel like they don’t know how to make the safest choice, and many rely solely on others making their birth decisions for them. Sadly, American birth outcomes clearly show that these decisions aren’t leading to good outcomes. With proper education and a prayerful heart, I believe that all women can be inspired to make choices that will ensure safe delivery for their children, whether that be a completely natural birth or one filled with medical interventions. If “pro-choice” is offered to birthing women, and women are given agency over their birthing experiences, they will be happy no matter what type of birth they have. They won’t feel backed into a corner. They won’t be manipulated, threatened, or intimidated. At the very LEAST, birthing women should be given as much respect as the women who chooses not to give birth at all. If you want to learn more about your choices as a birthing woman, order my book today and empower your birth!